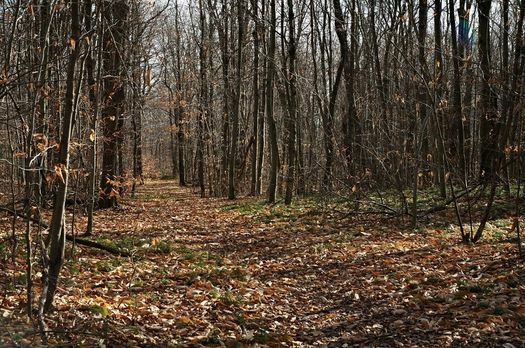 Ecology: Large, relatively unfragmented forest situated on the Rensselaer Plateau. Conifers are abundant and wetlands abound, especially bogs and fens. Appalachian oak-pine, deciduous wetland, evergreen northern hardwood, evergreen plantation, oak, successional hardwood, and sugar maple mesic forests. Bird Species: The site supports a great abundance and diversity of forest breeders, including many at-risk species. At-risk species breeding at the site include the American black duck (at least six pairs), pied-billed grebe, American bittern (use cattail wetlands in spring and might nest here), sharp-shinned hawk (at least five pairs), broad-winged hawk, olive-sided flycatcher (possible breeder), willow flycatcher (probable breeder), common raven, winter wren (at least 50), golden-crowned kinglet, Swainson’s thrush, wood thrush (15-30 pairs), blue-winged warbler (probable breeder), prairie warbler (possible breeder), and cerulean warbler (possible breeder). Characteristic forest breeders include the ruffed grouse, black-billed cuckoo, yellow-bellied sapsucker, eastern wood-pewee, least flycatcher, great crested flycatcher, blue-headed vireo, veery, chestnut-sided warbler, blackthroated blue warbler, black-throated green warbler, blackburnian warbler, blackpoll warbler, black-and-white warbler, American redstart, ovenbird, Canada warbler, scarlet tanager, rose-breasted grosbeak, Baltimore oriole, and purple finch. The red crossbill, white-winged crossbill, pine siskin, and evening grosbeak are also found here. At least 18 species of warblers breed here, including the Nashville, magnolia, black-throated blue, yellow-rumped, black-throated Green, blackburnian, mourning, and chestnut-sided. Bicknell’s thrushes use the area during migration.